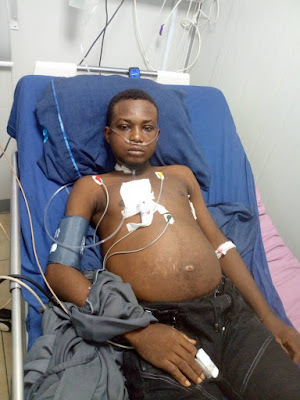 Second year student of Imo State University, Odoh Uchenna, 22, cries out for N10.5 million financial assistant he urgently needs for his end-stage kidney transplant. According to Uchenna, a first degree relative donor is available. All that is left is the finance to carry on the transplant at the St. Nicholas Hospital. Dear esteemed Nigerians, my name is Odoh Uchenna. I am 22 years old and a second year student of Imo State University Owerri. This letter is difficult for me to write but I feel it might interest well wishers and kind hearted Nigerians to know what is going on in my life. I have been suffering from end stage kidney failure since 30th April 2018. My desire is to pursue the option of kidney transplant as the best option to elongate my life. As a result of this sickness, I can't do the things I love doing. I can't stand for 2 minutes. I can't work a distance of one pole. Above all, I have been out of school. I have swollen face, legs and stomach. Recently, I had to undergo a procedure where 2 litres of water was removed from my heart. Before then, I could not breathe normally because the water enclosed my heart and made it difficult to function properly. You can imagine the cost of such process in Nigeria not to mention the excruciating pains I went through. My wish is to live, finish my education, live a quality life and have a positive impact on this earth. According to my nephrologist, transplant is still the recommended treatment for patients with end stage kidney disease. At this point in my life, I'm hoping to move for a transplant while the transplant team feel that I'm still medically suitable to undergo the procedure. As urgently requested by the St. Nicholas hospital Lagos, a first degree relative donor is available, but my family cannot afford #10.5million needed for the entire process. I have been going for three sessions of dialysis weekly since May 2018. The average cost of a session is #50,000. This amount to at least #600,000 per month. I have been admitted to the hospital on several occasions and the latest took a total sum of #601,000 from my family's pocket. As a result my family is left penniless. Please my fellow Nigerians, I'm pleading for your kind and generous donations towards saving my life. ACCOUNT NAME: ODOH UCHENNA BARTHLOWME. ACCOUNT NUMBER:0424084810. BANK GTBANK. Please once again, the total amount needed is 10.5 million NAIRA. As you contribute towards this process, may our God lord bless you and protect you and every member of your family from this kind of ailment. Amen.